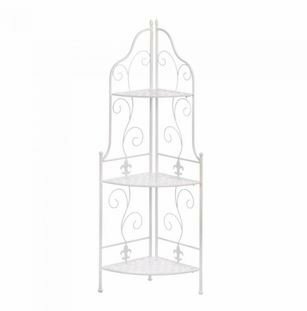 Smart Living Company 10017510 White Basket Weave Corner Rack by Smart Living at Tulips Orchids. MPN: 10017510. Hurry! Limited time offer. Offer valid only while supplies last. Bring big style to any little corner! This charming corner unit features three basket-weave shelves, scrolling flourishes, and fleur de lis accents. Bring big style to any little corner! This charming corner unit features three basket-weave shelves, scrolling flourishes, and fleur de lis accents. Its perfect for displaying your collection of keepsakes or your blooming green plants..
Bring big style to any little corner! This charming corner unit features three basket weave shelves, scrolling flourishes, and fleur de lis accents. It's perfect for displaying your collection of keepsakes or your blooming green plants..